Urgent Care Centers are in practically every city of every state. Yet, some people go their whole lives without ever stepping inside one when it might have saved them time, money, and would have been more convenient than visiting their primary care physician. So what’s the reason so many people avoid Urgent Cares? We’ve found that it’s because they don’t know what’s inside! This article helps clear up some of the more common misconceptions surrounding these handy healthcare facilities. If you’re in the industry you know the answer, but most people that haven’t set foot in a UC don’t! Urgent Care Clinics are medical offices that offer examinations and treatments for colds, ailments, and minor injuries that need urgent attention. These walk-in facilities offer a long list of services that a lot of people think are only available from family doctors or primary care physicians. Urgent Cares often have night and weekend hours for patients to take advantage of when their usual doctors are either unavailable, or when they need immediate care and can’t wait for an appointment. Appointments aren’t necessary for urgent clinics. Nor do people have to be existing patients in order to be qualified for treatment. Urgent cares offer a list of services including, but not limited to, physicals, check-ups, flu shots, bug bites, drug testing, x-ray services, seasonal care, and family care. Without the need to schedule an appointment, people find it far more convenient to visit urgent cares instead. Perhaps one of the more important points to address first, is that the physicians employed at urgent care facilities are board-certified doctors who know what they’re doing. They aren’t doctors who wandered in off the streets or med students who settled for an urgent care because he or she couldn’t make it at a hospital – they’re experts who provide communities with quick and affordable healthcare. The walk-in convenience of urgent cares doesn’t mean these clinics are emergency rooms. They’re not. In the event of a dire emergency there are worse places to be than an urgent care surrounded by medical staff. But this isn’t, and shouldn’t, be the go to place for emergency medical treatment. Instances where that level of serious treatment is called for falls under 911 territory, and not something you go to an urgent care for. First time patients can think it’s expensive, when it’s not. Urgent care clinics provide affordable healthcare to patients, no appointment necessary, without any kind of “short notice” fee. The business model for these clinics cater to people who want quick and effective treatment without paying the arm and leg they went in there to fix. People who can’t afford a primary health physician, or who don’t visit a doctor very often, find urgent cares to be a better fit for them. First-time patients usually visit urgent cares with one thing in mind, and that’s whatever brought them there in the first place. People who are unfamiliar with urgent care clinics tend to be out of the loop when it comes to services they can take advantage of while there – so how do you inform them? That’s where Urgent Care TV comes into focus. Urgent Care TV from It’s Relevant TV is a marketing tool that, rather than focusing on patient acquisition, focuses more on patient retention. It gets people to come back more. It educates them on all the reasons to come back. It’s Relevant is a living, breathing TV network with a library of over half a million videos. The interesting, and family friendly content improves patient experience and exposes them to the things you want them to see. It’s Relevant TV is more than an advertising platform, it’s a tool to help connect with visitors in ways that can’t be done with cable or a looping video display. They should have a better time while they are there. If they have a better experience they will be more willing to come back again. Utilizing in-clinic marketing will provide your business with a more well-rounded marketing approach. Patients will gain an added desire to follow you by seeing the great posts you make. You are also able to target actual patients who are more likely to act upon your messaging. A good experience leads to a good review. Prospective patients will look at the opinions of others before visiting your center. Do I Have Enough Videos to Display on a TV in my Business? Good question. If you’re a business owner looking to do more with your TV, then chances are you’ve seen the value of using custom videos to showcase your brand. Swapping out cable for something with a little more personal touch can be a great investment if done correctly. If you’re looking for an alternative to cable, check out It’s Relevant TV. The first step towards making a successful business TV is content. Whether it’s content that you paid someone to make for you or content that you put together yourself, the videos that play are the bread and butter of your business TV. But how many videos is too little, or too much? Having too few custom videos gets repetitive – looping the same thing again and again is boring. Showcasing only a few of your own videos on their own may turn your messages into something that ends up annoying people instead of attracting them. If you’re looking to keep things interesting, you don’t want to show the same thing over and over again. When it comes to the other side of the coin, there isn’t necessarily such a thing as too many custom videos. The longer your list of content, the more you’re exposing people to your brand. If there is a downside to building an effective library of content, it’s the time and money that goes into producing it, and sometimes maintaining it. Unless you have a lot of both to invest in your TV, it can be difficult putting together something worthwhile. If you’re interested in utilizing custom videos on your business TV, and what you have doesn’t fit your vision – It’s Relevant can help. We recommend creating a custom TV network that combines the videos you have – even if it’s only 1 or 2, with loads of other content to keep your visitors interested. 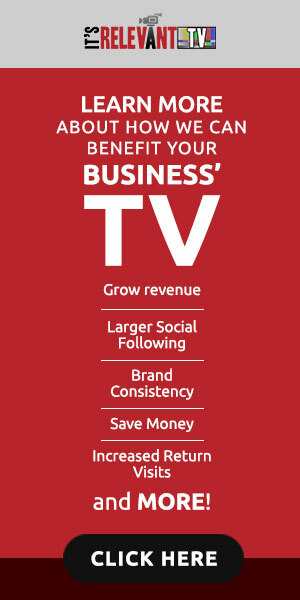 It’s Relevant provides businesses with a living, breathing, TV network that is fully customizable and easy to control. Our platform delivers interesting, short-form content that draws people’s attention so they can see your messages playing alongside the videos. If there’s something you want visitors to walk away with after they leave your business, we can help you get that message across. If there is one downside to an external market solution, it is the high cost that comes with it – though advertising on platforms outside your business isn’t the only answer. Too few business owners recognize the potential to market inside their businesses when such a solution can be both cost effective, and beneficial for drawing in more business – not from attracting new customers, but rather by getting older ones to return instead. In the end, the most important step is choosing which platform will carry your brand and message. When it comes to market strategies there are two simple truths to consider. One; it’s more expensive to market outside of your business than it is to market inside it. And two; it’s easier to get an existing customer to come back than it is to get a new customer to visit for the first time. That’s where It’s Relevant TV shines. It’s Relevant is a service that transforms business TVs into tools that not only allows you to market your brand, but improves visitor experience as well. The service gives your business access to ever-changing interesting short-form content that’s designed to draw the eye better than traditional signage. And while people are engaged, they are exposed to your brand and messages. It’s Relevant TV saves on the traditional marketing costs while using a more effective medium – your TV. It targets existing customers, getting them to come back more, and spend more.